Just returned from a 17-day motoring vacation that took us up along the Eastern Sierra, into a little of Nevada, then eastern Oregon, then through the Columbia River Gorge, then back over to Carson City and Virginia City, Nevada, past Lake Tahoe, and down the 5 to home. Of course, as history seekers, my wife and I always want to check out historic sites wherever we go. And this trip turned out to be a sort of “Magical History Tour” (apologies to the Beatles) as we discovered some impressive sites. We visited places like the Douglas County Historical Museum and Cultural Center in Gardnerville, Nevada (three stories full of exhibits in a former school building), Sumpter Valley Dredge State Heritage Area in Oregon (where we toured a dredge the size of a river boat), and the Grant County Historical Museum in Canyon City, Oregon (with thousands of local history items on display). History is history, and San Diego County shares many historical parallels with other western regions. So we’d like to share some photographic and narrative highlights of two historic sites we visited. 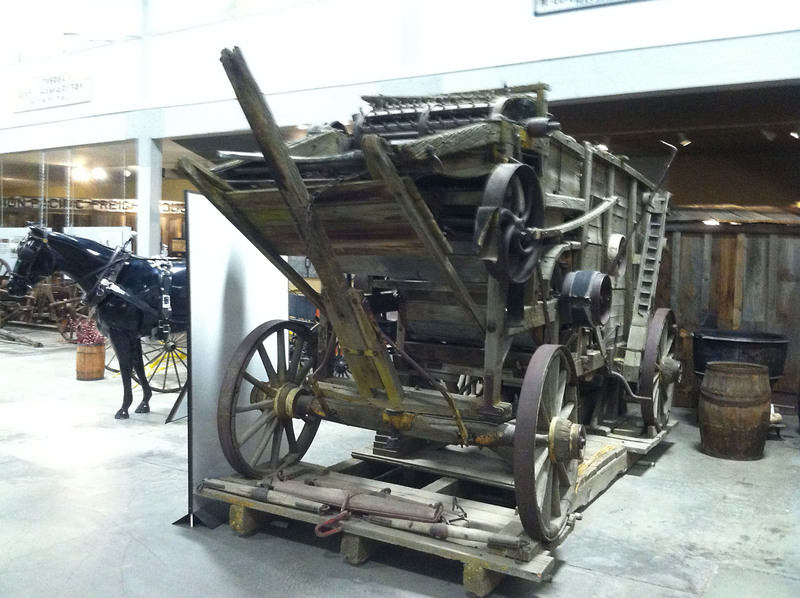 This is a photo of one of the exhibits at the National Historic Oregon Trail Interpretive Center (NHOTIC) in Baker City, Oregon. You pass through a series of lifesize recreations illustrating pioneer travels and the settlement of Oregon. 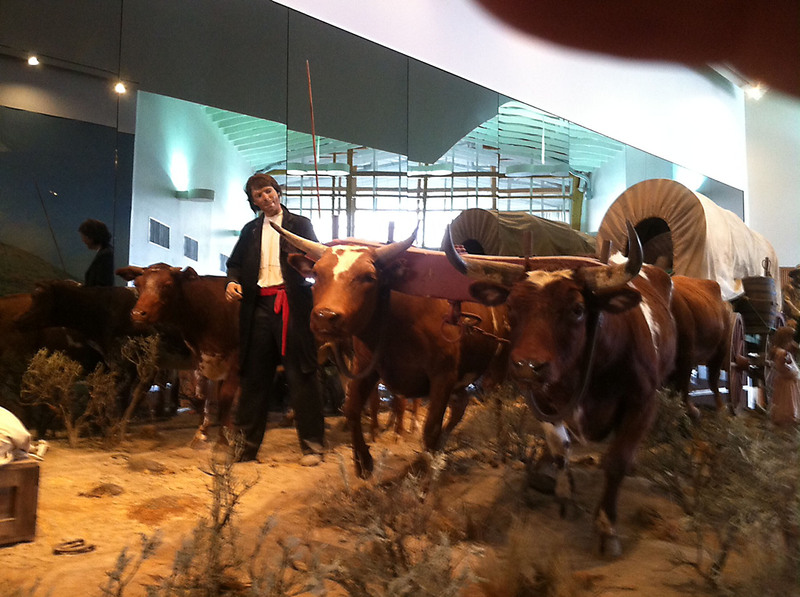 The exhibits also include recordings taken from the diaries of pioneers who came over the Oregon Trail. The NHOTIC, which is run by the Bureau of Land Management of the U.S. Department of the Interior, also offers living history demonstrations, interpretive programs, multi-media special events, and over four miles of interpretive trails. For further info, check out their website: http://www.blm.gov/or/oregontrail/ . 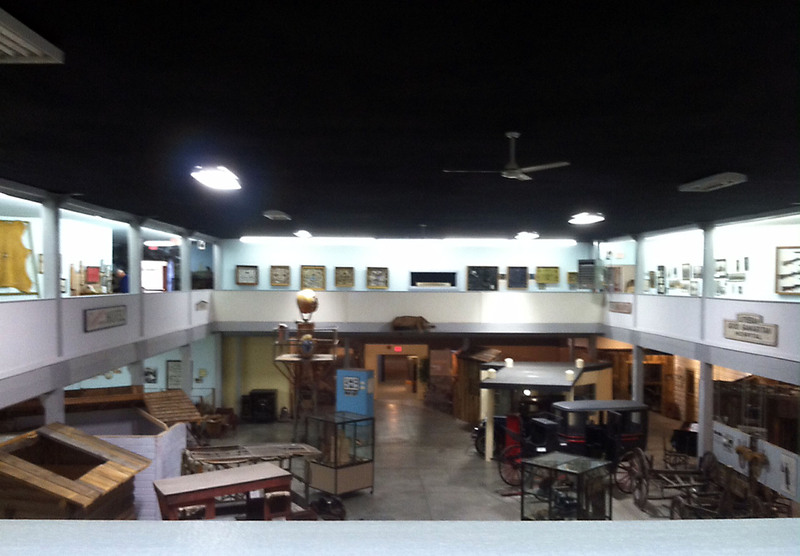 Baker City is also home to the Baker Heritage Museum. The area in and around Baker City was the scene of a gold rush in the late 1880s and 90s. By 1897 the Baker Gold District had 513 mines and Baker City, dubbed “Queen City of the Mines,” was the third largest city in Oregon and the fastest growing community in the Old West. It was a center not only for gold, but for the agriculture and timber industries as well. The museum is in a former natatorium building saved from demolition by the local historical society. The building is stocked with all kinds of exhibits related to the local history, including two stagecoaches and a threshing machine, as well as all manner of clothing and household items, all donated by the descendants of pioneer families. We found the story of the building’s rescue and transformation and the strong participation by the local community to be especially inspiring when we found out that the total population of Baker City and County is 16,000. An important lesson here for San Diego County. Here’s the Baker Heritage Museum website: http://www.bakerheritagemuseum.com/ . “Merton and Stowe: Lost Towns of the Poway Valley,” is the subject of a talk by yours truly, aka Vincent Rossi, the San Diego History Seeker, Wednesday, August 27,11 am-Noon, at the North County Inland Center. The center is at Temple Adat Shalom, 15905 Pomerado Road, Poway. For further details call 858-674-1123. Grape Day, Escondido’s most historic event, takes place Saturday, September 6. A 5K fun run starts at 7:30, followed by a parade down Grand Avenue, culminating in the festival in Grape Day Park from 9:30 to 4. Free event includes grape stomping, an entertainment stage, vendor booths, fun zone, free grapes courtesy of Jimbo’s Naturally, a wine and craft beer tasting pavilion and lots more. For more info visit http://www.escondidohistory.org/index.html . Open house at the Vista Historical Museum, 1-3 on Saturday, Sept 13. Learn about the history of the museum, the former Rancho Minerva, and a little Greek culture. Hosted by three Girl Scouts earning their Silver Award. This is a community event and anyone can join. $7 donation includes tour, snack, presentation and patch. For further info call 760-630-0444.